From end to end, this corner of Scotland measures around a mile and there’s a resident population of just 17,000. Anywhere else in the world and this would be no more than your average seaside resort. Never has a town been so defined by a single sport and with the Open fast approaching, the residents are hard at work ensuring the 200,000 spectators, 2,000 media and 156 golfers see the town at its finest. Lisa Lynch is a waitress at the local haunt – North Point Café. She and her husband are trying for a baby – one they hope will grow up to be a successful golfer. Lynch doesn’t play golf herself, but as a resident of St Andrews she is an owner of the course itself, thanks to the 1894 Links Act of Parliament. This law means the links are public land, open to all, and it’s not unusual to see a resident walking their dog across Grannie Clark’s Wynd, a single-track road that traverses the two most famous fairways in golf. Secretary Patrick Laughlin also runs a charity called the St Andrews Partnership and said that when the Open is on, day-to-day life is surprisingly unaffected. A month before the event takes place, the Old Course closes, while a portion of the Jubilee is the practice area for the professionals. But rather than complain about the disruption, the members still feel privileged that the Open returns to their course. “The buzz inside the club during Open week, you could almost say it’s shaking the foundations,” Richardson said, while gazing out over the fairway towards the grandstands. 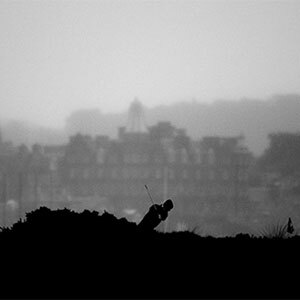 Only 25 per cent of the golf played on the St Andrews Links is by locals. And tourists from all over the world come to this corner of Scotland to make up the remaining 75 per cent, bringing billions of pounds into the economy. There will be some disruptions and those heading to the supermarket may have to head out a little earlier. Thankfully it’s the summer holidays so there’s no school run to worry about. But every five years, this becomes the epicentre of the golfing world and the residents have learned there is no better way to showcase their hometown than the Open Championship at St Andrews.